In the finance class that I teach, one of the first things we discuss is spending money intentionally. I like using the example of a quality mattress and two sets of quality sheets being the first purchase you make in home furnishings. I won’t go through the entire exercise now but a good night of sleep is probably the most important thing your home offers you. When we were visiting family recently, we had the opportunity to experience a new-to-me sleeping item that really enhances the experience. 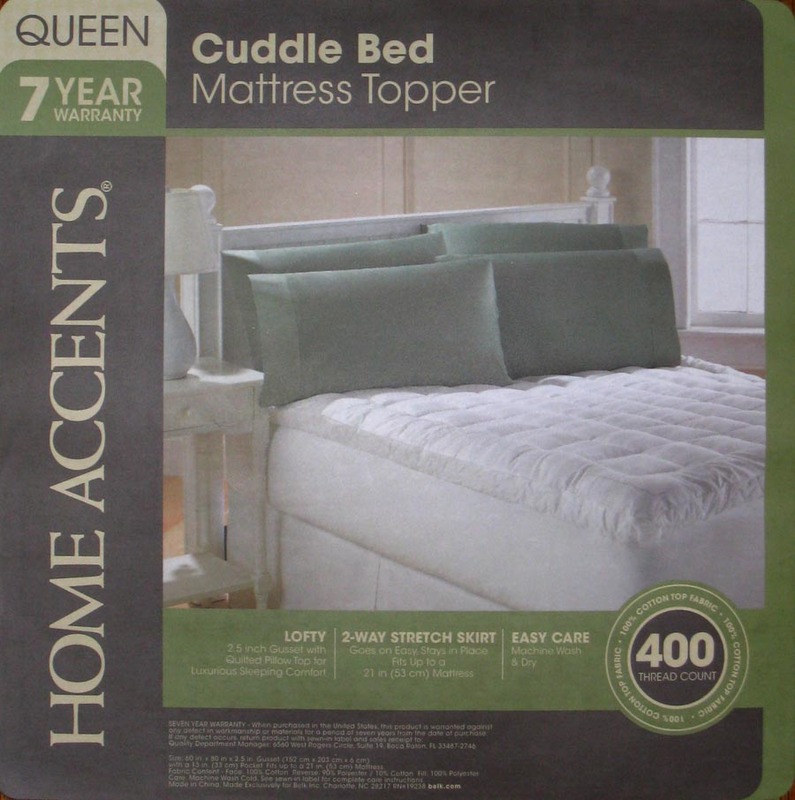 It goes by several different names: a pillow top mattress cover, a mattress pad, a topper and I’m sure even more. It is a combination of the various soft pads people used to put on old beds to “freshen” them up and a standard mattress cover that protects the mattress from stains. By combining the two you get something that works better than either could alone. The padding doesn’t shift around and bunch up under the sheets, it protects the mattress and, most importantly, it provides the right amount of cushioning. This last point is the real show stopper. I’m sure all of you have experienced extra padding on a bed before. Maybe it was to relieve pressure points from a poorly design spring system. Maybe the mattress was just too firm. Maybe you had some egg crate foam that you used in college or more recently you tried that memory foam developed by NASA. If you are like me, none of that stuff worked well. In fact, if you are like me, it made the sleeping experience worse. You felt like you were drowning in the mattress or sticking to it and in every case, it trapped your body heat causing you to slow roast rather than slumber. If the above applies to you, I’m here to tell you that a solution exists. Once we returned home to our own bed, we were determined to find a cover that performed like the one we had been vacationing on. That particular cover was developed for Marriot for their higher-end hotels but we were sure a cheaper local solution must exist. After much comparison shopping with lots of touching and smooshing, we found the right item at Belk and it was on a Labor Day sale (pictured above). It has just the right amount of filling. If you get too little it doesn’t feel any different. If you get too much you sink in and your legs float above your head. It has to have the right kind of filling. For us, 100% polyester did the trick. I’m sure it will wear out quicker than memory foam but as mentioned before, foam just gets way too hot. So there you have it. For an extra good night’s sleep I recommend a cover with 4lbs 10oz of 100% polyester filling (queen size weight). It should have a skirt that allows it to attach to the bed. Your results may vary so get one, take it home, put it on the bed with sheets over it and give it a test run. Don’t sleep on it until you are sure you want to keep it though. Rightfully, the stores don’t want to take them back after that.